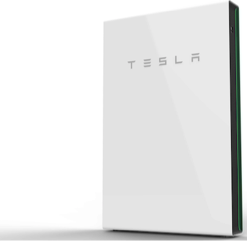 We’re excited to announce that Tesla Powerwall is now available to our customers in BC. The new Powerwall 2 is a home battery system that allows you to store 13.5 kWh of energy per unit. The energy can be used at a later time or provide clean back-up power in the event of utility outages. MPower Energy Solutions is the Canadian distributor of Powerwall and chose Terratek Energy Systems to be one of its certified installers — the only one in the Okanagan and Southern Interior. We have completed extensive Tesla Powerwall and MPOWER training. For most BC residents with solar panels, Powerwall is not necessary to benefit from solar power. That’s because anyone who has a smart meter is able to use our electricity grid like a personal battery. When your solar panels are producing excess electricity it is sent to the grid and you receive credits on your bill. If solar is not providing all of the energy, the grid will supply the rest. Powerwall provides a safe, reliable solution for backup power during outages allowing you to power essential loads like refrigeration, lights and pumps for a short period of time. Rather than having to deal with the fueling and maintenance, not to mention noise pollution with a fossil fuel generator, Powerwall operates seamlessly, quietly, and can be integrated with a solar grid tied system. Hospitals or other organizations that need to run critical equipment can benefit from Powerwall as a back-up. Powerwall is also an effective solution for people living in areas with unreliable electricity and unexpected power surges. In these situations, Powerwall provides back-up power and safety from power surges, which can be costly if sensitive equipment is damaged. Powerwall is most effective in regions where there is time of use billing, which most of BC does not currently have. In these situations, Powerwall allows you to store solar energy and use this energy when electricity prices are most expensive. Ontario and some areas of BC have time-of-use billing, making Powerwall a smart way to circumvent peak rates. We’re also hearing from some of our clients that they want Tesla Powerwall as part of a larger shift to renewable energy solutions. For example, if you already own a Tesla car, Powerwall comes with its own app that allows you to monitor all of your Tesla products including the Model S and Model X vehicles, Powerwall, and solar panels. We are excited to offer Powerwall, which represents a turning point for the renewable energy industry globally. To date, the weakest link for renewable energy has been its ability to store energy once it’s been created. Powerwall has broken barriers to past storage technology in terms of both cost and longevity providing options for people to truly disconnect from their electrical utility. While Powerwall isn’t the final answer, Tesla’s focus and investment in lithium ion batteries has helped accelerate solar at an unprecedented rate. Many energy experts now say solar is at a point where it’s deemed unstoppable. We’re looking forward to installing our first Powerwalls in the Okanagan and the Lower Mainland soon. Stay tuned for updates!